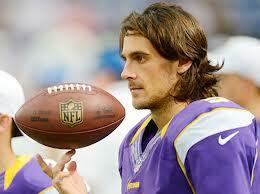 Vikings Punter Chris Kluwe Is Also a Gifted Speedreader | Speed Reading Plus Blog! When I think of famous speedreaders, I think of John Kennedy, Teddy Roosevelt, and Jimmy Carter. Presidents, not punters. But Chris Kluwe, punter for the Minnesota Vikings, is also a speedreader. Chris says he stumbled into punting, as his boyhood was defined by science fiction and fantasy literature, not by football. He was able to read a lot more Ray Bradbury books when he discovered speed reading. Chris estimates that it takes him 15 seconds to read a page of text. To read more about Chris Kluwe, see the October 22, 2012 issue of Sports Illustrated. This entry was posted in reading, self development, speed reading, speedreading and tagged books, Chris Kluwe, famous speedreaders, fantasy literature, football, Jimmy Carter, John Kennedy, Minnesota Vikings, pleasure reading, presidents, print reading, punter, Ray Bradbury, reading, reading improvement, science fiction, speed reader, speed reading, speed reading lessons, speedreader, speedreading, Teddy Roosevelt. Bookmark the permalink.